Below is the first edition of NVTBL's weekly blog that will highlight common baseball injuries and include exercises to decrease the chances of sustaining those injuries. Blogs will be written by Seth Blee, who is a Doctor of Physical Therapy. Blee runs the physical therapy side of Inova’s Sports Medicine Program and is the Physical Therapist for the Washington Nationals. He is also a former coach with the NVTBL and is on the Pro Advisory committee. Click here for more info on Seth Blee. What is a SLAP tear and why is it so common in baseball? A SLAP tear stands for superior labrum anterior to posterior and is a tear of the labrum of the shoulder. That means there is a tear that goes from the front of the labrum to the back. If you visualize the shoulder as a ball in a socket, the ball is much bigger than the socket, so the labrum lines the socket to make it deeper. Another analogy is like a cup on a saucer and the labrum is like a ridge that makes the part that the cup sit in deeper so that it does not slide off. The bicep tendon attaches to the top of the labrum and when the shoulder continues to get pulled forward in the socket, the bicep tendon can create a peel back injury where the top of the labrum gets torn. 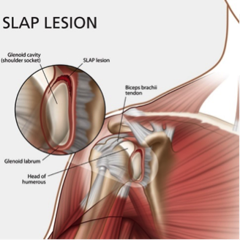 So, what should be done to prevent a SLAP tear? There are many factors that contribute to tears of throwing shoulders including taking ample time off, having efficient mechanics and good use of the lower body and core, etc. The most important muscles to keep strong and healthy are the posterior rotator cuff muscles. The stronger that the cuff is, the better that the ball of the shoulder (humeral head) will be held in the socket and the less likely that it will peel back the top of the labrum. 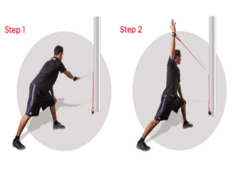 Two important exercises to include are external rotations (“W”) and reverse throws. In both cases, the emphasis should be on slow control of the exercises, especially in the return to starting position (eccentric strengthening). 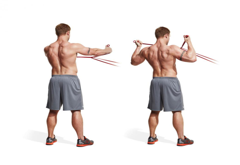 “W” exercise: Holding a band at shoulder height, pull the bands back into external rotation without arching your back. Slowly return to the starting position. Reverse throws: starting in a lunge position, pull back into a wind-up position (can vary based on normal arm slot) and then slowly return to starting position. The return should be done in slow motion and should be about 1/3rd the speed of the pull back.